Japan’s Olympic consortium of 10 broadcasters are sharing a labyrinth of small broadcast studios deep within the International Broadcast Center in Sochi’s Olympic Coastal Cluster. 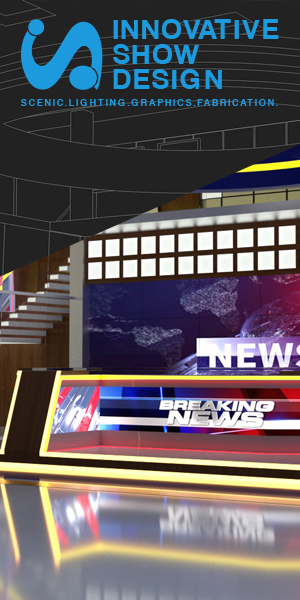 Their studio sets range from bright and active game show styles to environments resembling the interior of a mountain cabin. 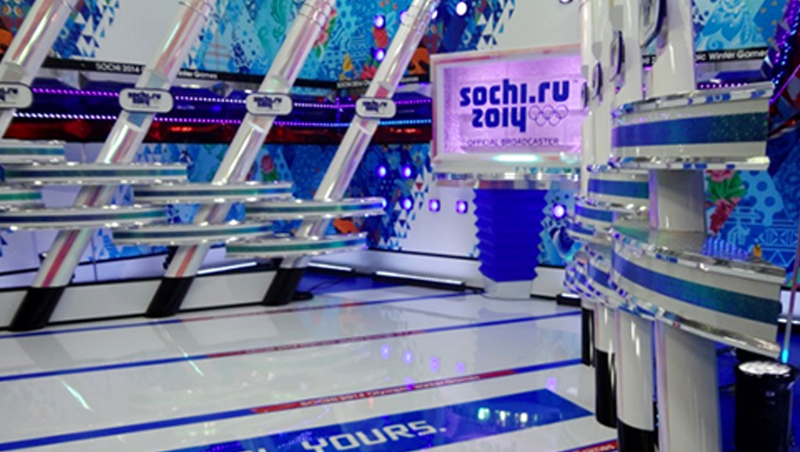 The TBS studio design is inspired by the official Sochi Olympic visual look based on the patchwork quilt principle. The glossy white floor has the official Olympic slogan, “Hot. Cool. Yours.” applied to the surface. Angular acrylic tubes, metallic shelves and an assortment of LED lights frame the space while a bubble tank in the shape of a monitor anchors the center area of the studio. 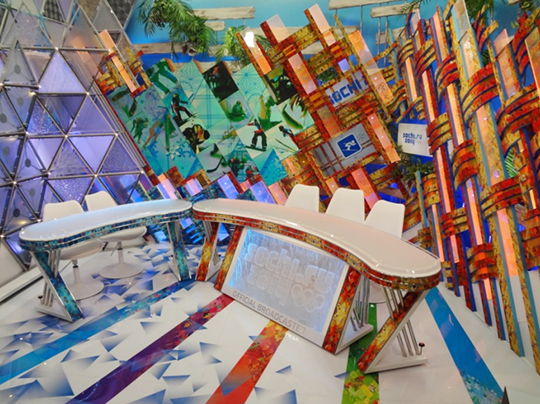 FUJI TV has also gone bold and bright with their studio design. Again, the designer has taken a cue from the official Sochi Olympic patchwork quilt graphic by inter-weaving bands of the orange and yellow tones on camera right. The juxtaposition of the “hot and cool” concept is illustrated on camera left with icy acrylic triangles and on the top areas of the set with weathered boards and palm fronds. The floor is a bright white vinyl with multi-coloured bands. The desks are clean and simple with edging details taken from the official quilt graphic. One desk has a frosted acrylic panel embossed with the Sochi logo and Olympic rings. TV Tokyo has embraced the winter lodge aesthetic. Hardwood flooring, large wooden beams, tongue and groove wood panelled walls and a series of frosted windows anchors the space. The focal point of the set is a large stone fireplace complete with a stack of firewood. A mobile monitor unit and ornate lectern root the host position. Nippon TV has also embraced the winter lodge design concept but in a more asian and modern style. 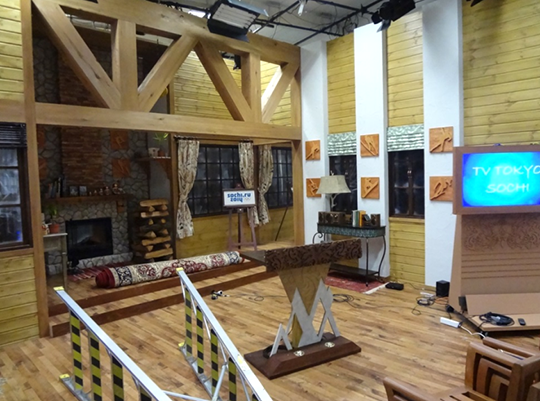 Like FUJI TV, the set is framed with wooden beams and wood panelled walls. Large circular windows and a central shelf unit anchor the camera right area , while a red and silver “North Pole” is positioned camera left. A modern fireplace is the central focus of the studio, complete with the warm glow of a fire and a large monitor positioned above the mantle piece. Interested in other Olympic studio designs? Check out the CBC studio or the NBC studio. The studio designs for the Japanese Olympic broadcasters are vastly different from the sets of their western competitors. The emphasis is more on fun and action while other broadcaster’s sports studios typically have anchor desks, monitors, video walls and backlit graphics.